Windows can't just make a bootable CD but BartPE's PE Builder will use your install disc to create a very useful, bootable, Windows utility CD. Back in the "old days" (think before Windows XP) when you wanted to create something to boot from you'd grab a floppy, format it, run the "SYS" program to install the boot sector and a couple of basic files into the disk and then copy whatever other files you wanted and you'd be done. Life's not so simple any more. Mostly to prevent piracy, but also in part due to the shift to CD-ROM and DVD-ROM, Windows can't by itself be used to create a bootable disc. Nonetheless I found myself in need of a copy of Windows I could boot from CD-ROM. I wanted to use the backup program DriveImage XML. to restore a backup image. That meant I couldn't boot from the hard drive I was planning to restore to. I needed a Windows boot CD. So, using "BartPE", I made one. "By using your Windows files the process avoids any legal issues ..."
Your Original Windows XP installation media or the original installation files (often the infamous "C:\I386" folder), or the reinstallation files as part of a recovery partition. This needs to be for Windows XP SP1 or better. If you have pre-SP1 you can create a slipstream disc. If you don't have the original installation media or files you cannot create a boot disk. Simply having an installed copy of Windows is not enough. PE Builder, a free downloadable tool to make what's nicknamed a "BartPE". Perhaps a gigabyte of free space on a hard drive. It's actually not terribly difficult once you have all the above. "PE" stands for "preinstalled environment" - basically a bootable ready-to-go setup of Windows with all the tools and utilities you might want to use. Bart? He's the guy that developed this very popular utility for building a PE, hence it's the "BartPE". 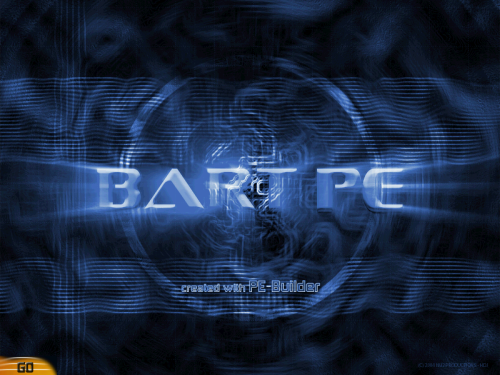 A BartPE is created by using the PE Builder to create a disc image comprised of Windows files from your original Windows installation, Bart's pre-defined configuration, and several optional tools. By using your Windows files the process avoids any legal issues - Bart didn't have to give you any copies, you'll simply use the ones that are already legally yours. 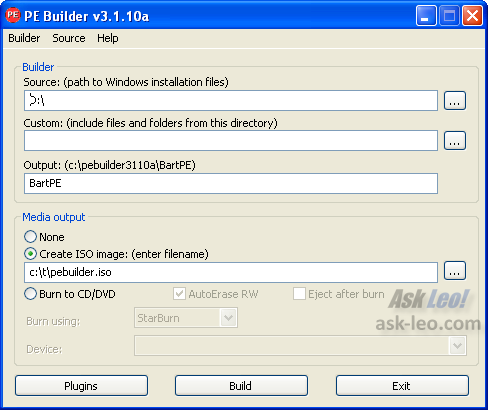 Download and install PE Builder from the BartPE site, and accept the defaults as you like. Source: this will be the drive containing your Windows installation CD, or perhaps the location of your installation files (for example C:\I386 if that exists). In the example above, I've specified "D:" which is my CD-ROM. Output: is the folder into which PE builder will assemble your files. The default should be fine. Media Output: I've selected "Create ISO image" which I can then later burn to a CD. You can also select "Burn to CD" directly if you like. The PE Builder can include a number of plugins that you might want to select. In addition, some utilities make BartPE plugins available that you can add (using the Add button here). I've highlighted the DriveImage XML plugin because it's not a default plugin, but rather one that I downloaded from the DriveImage XML site and added to the list. You'll note it's enabled. Click Close to return to the main PE Builder screen. That's really about all there is to it. Click on Build to create your BartPE bootable CD or CD image. To use BartPE you simply boot from the CD you created in the steps above. Don't let the looks fool you - there's a minimal version of Windows under there. You can see that the optional DriveImage XML component I installed is present and ready to be used. Bart PE itself is more than can be covered here, but one important item to make the utility of this setup a little more obvious. You'll note that "C:" is there - that's the hard disk on this machine. The hard disk that I did not boot from. It's there and visible and ready for whatever you might feel the need to do; recover files, format or whatever. There are many, many utilities and optional plugins for BartPE - many more than I can cover here. And yes, it's a tad on the geeky side for the casual user perhaps, but now you can create one, and start exploring and - with caution of course - experimenting a little. How do I make a Windows XP boot disk? Unfortunately you can't just "make a boot disk", but there are approaches that will allow you to boot from CD to access the contents of your hard disk. I don't have an installation CD for Windows XP - what if I need one? At some point you'll need your Windows installation CD. If you don't have one, you could be out of luck. Be sure to get one and keep it safe. Who gets a windows CD/DVD with a new computer, anymore. I had to burn recovery disks at my own expense. My co-worker didn't even bother to make one at all. Beware: a recovery disk is not the same as a installation disk and will not help you for certain types of failures (like hard drive failures). Everyone should get an installation disk - even if they have to ask, and even if it costs a little extra. The Windows 7 AIK includes a PE environment you can use to create bootable CDs though from what I've been able to find, it only seems to support a command line interface and no form of Windows Explorer. Is there a way to configure a windows 7 PE CD with explorer, TCP/IP, client for Mictosoft Networks, and maybe IE? It is also my understanding the above procedure will not work if all you have is a OEM version of Windows XP. Does BartPE apply to Vista and Windows 7? If not, then what program would apply all three OS's? A little curious why you didn't do a WinPE? 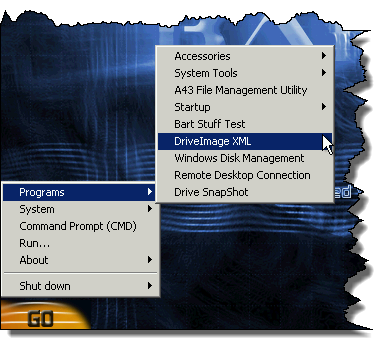 The tool I was using (driveimgxml) had a BartPE plugin. My partner recently fell for one of those 'fake anti-virus' popups - Smart Engine to be precise. 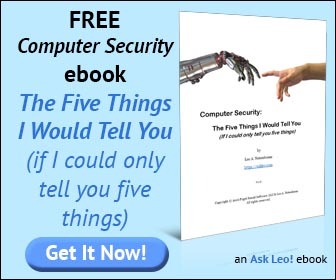 This nasty little program disabled all methods of getting rid of it (it bypassed Avast, Search & Destroy, prevented Trend Micro's Housecall from running, stopped Task Manager and prevented Regedit from making any changes). After suffering through a long-winded re-installation from scratch (XP+SP2, 80+ updates, SP3, 80+ updates), I came looking for a suitable 'jump-start' point - only to be worried by the OEM comment above. I only have the "re-installation" disks, with the laptop's manufacturer stamped all over them. Granted, it's a full copy of windows (not a Recovery system), but will it still work? Chances are it will not, but there's no harm in trying. HOw to make the bart pe in windows 7 or vista ????? i accidentally edited the boot.ini file..when i reboot my laptop it just wont boot.with error:windows couldnt start because of hardware configuration error. so i need a windows xp recovery cd?or just use knoppix to boot into my harddisk?